On the evening of the 24th of October something weird and wonderful took place throughout Sheffield University’s Student Union. The Bare Project was commission by the Student Union to create an immersive theatre tour of the Student’s Union for 200 VIP guests to showcase the brand new union building. 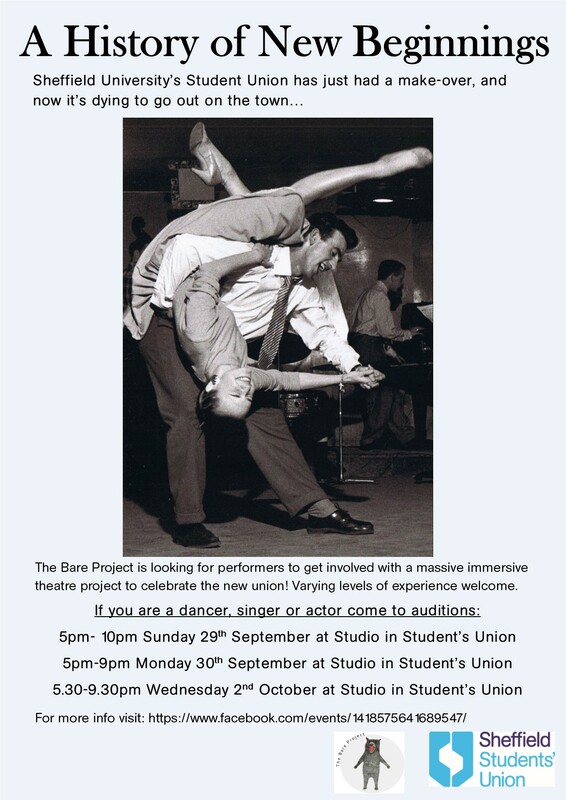 We had 50 students take part as perfomers in a turn of the century dance with the University’s stern Registrar peeking over everyone’s shoulders ensuring ‘no funny business’, we created a firewatch in the amphitheatre on the night a brothel on Glossop Road caught fire during WW2. And blocked the stairwells with numerous protests seen in the Union over the years. Set design by Laura Jane Blake. Video and photos on their way!